The countdown to the Oscars has officially started! Whether you are seeing all the last minute movies, or anticipating the red carpet showdown, there is a lot to be excited about this coming Sunday. I like to celebrate the Oscars with fancy finger food. An “appetizers for dinner” sort of menu. I think this makes the evening more of a cocktail party, and then I can sit and watch the show instead of worrying about what’s going on the kitchen. When I make these sort of menus, it is essential to have variety of appetizer choices so that the guests feel like they are eating a lot of different items. The easiest elements to vary are temperature, texture, and taste. Today’s recipe is a very easy pizza recipe, with a paleo twist to make things interesting. A few weeks ago, I wrote a post about the Paleo Diet. I vowed to experiment with some paleo-inspired recipes, and came away with this pizza as a new favorite. This pizza is paleo-approved because the crust is made from almond flour and cauliflower. I wasn’t exactly sure how this would taste, but the almonds give it a great nutty taste and the cauliflower gives the crust a crunchy texture. It holds together very well, which made it an ideal appetizer choice. 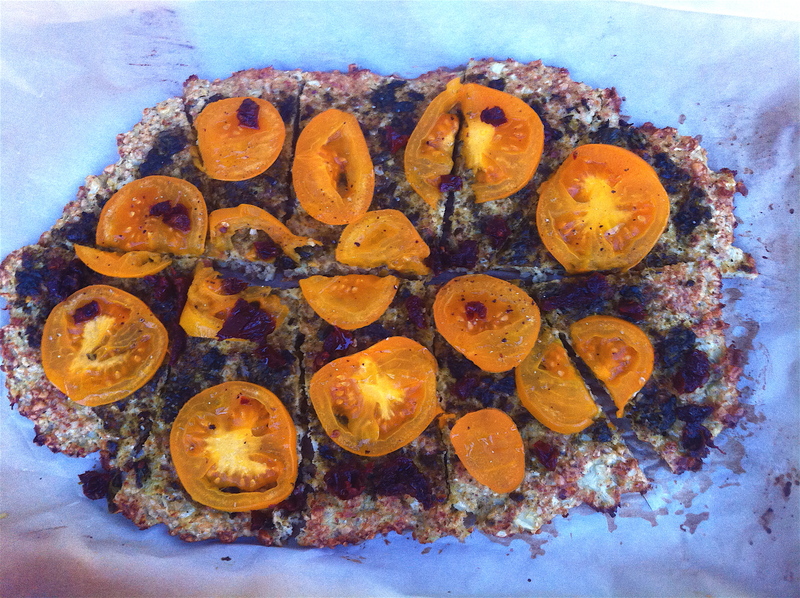 I kept the recipe strictly paleo, with sun dried tomatoes, fresh tomatoes, pesto and pine nuts. If you can’t bare the thought of leaving behind the cheese, go ahead and add it. The crust is a delicious platform for any set of toppings. You can make this recipe a little ahead of time and keep it warm under foil. It doesn’t need to be served piping hot. Roughly chop the cauliflower flourettes and put them in a food processor. Pulse them in short increments until they are very finely chopped. Be careful not to grind the cauliflower in a steady stream, or it will become mushy and stick together. It should look like puffed rice and not a puree. You need two cups of cauliflower for the recipe. Whisk the eggs in a large bowl. Add the yeast and spices. Let the mixture sit for about two minutes. Add the cauliflower and almond flour, and use a spatula to fold the ingredients together until they are well blended. If it seems really sticky, add another tablespoon of almond flour. Please note: the “dough” will not resemble pizza dough whatsoever. It should appear slightly sticky so that it will hold together, but you won’t be able to knead it like a traditional pizza. Line a cookie sheet with parchment paper and put the dough in center of the sheet. Use a spatula to smooth it into an even layer and into the shape you desire. It should just short of 1/2 of an inch thick. Bake the crust for 25 minutes. Remove the crust from the oven and spread the pesto over the crust, leaving a slight edge around the outside. Add the tomatoes and sun dried tomatoes to the top of the pizza. Bake another 7-12 minutes, or until the tomatoes have a roasted appearance and the crust is firm. Remove from the oven and top with the toasted pine nuts. Let the pizza sit for a minute or two before slicing.